Trump made the comment Wednesday in the Oval Office, sitting alongside former Secretary of State Henry Kissinger. Vice President Mike Pence defended the president’s move Wednesday, saying Trump “made the right decision at the right time” when he fired Comey. Critics of the move to dismiss Comey have said it raises questions about the FBI’s probe into Russian meddling in the November presidential election and possible collusion between Trump campaign aides and Russian interests. FBI Director James Comey speaks to the Anti-Defamation League National Leadership Summit in Washington, Monday, May 8, 2017. Senator Dianne Feinstein, the ranking Democrat on the Judiciary Committee, said Wednesday that she was “incredulous” over Trump’s firing of Comey. The California senator said the appropriateness and timing of the Comey’s dismissal could implicate the administration and called for the matter to be addressed. The administration’s reasons for Comey’s removal were outlined in two separate letters written by Attorney General Jeff Sessions and his deputy, Rod Rosenstein. 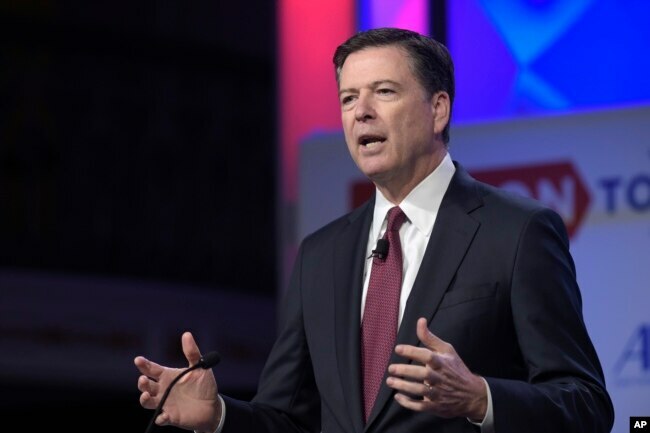 Comey “made serious mistakes” handling the conclusion of the investigation of emails of Trump’s general election opponent, Hillary Clinton, Rosenstein wrote. He also accused the former FBI director of usurping the attorney general’s authority when Comey concluded there should be no prosecution of the former secretary of state. Jason Chaffetz, chairman of the House Oversight and Government Reform Committee, wrote a letter Wednesday to the FBI’s inspector general asking that a review of the agency’s actions in relation to the election be expanded to include an investigation of Comey’s dismissal. The only other FBI director to ever be fired was William Sessions, who was dismissed by President Bill Clinton in 1993. Clinton named a replacement the next day. Trump has not yet announced a nominee, who will need to be confirmed by the Senate. But other Republican members of Congress suggested the president’s action caused a breach. Amash also termed as “bizarre” Trump’s reference in the termination letter to Comey that the FBI director had assured the president repeatedly that the U.S. leader himself was not under investigation. Democratic senators on Wednesday called for appointment of a special prosecutor to continue the Justice Department’s investigation into alleged ties between Trump’s presidential campaign last year and Russia. Senate Minority Leader Chuck Schumer of New York said he told Trump “you’re making a very big mistake” by firing Comey, amid the various investigations connected to the president’s 2016 campaign. The Washington Post, citing an anonymous source, reported early Thursday that Rosenstein threatened to resign when he found out that the White House was portraying him as the primary person who wanted to fire Comey, and that the president was merely following his recommendation. The Senate intelligence committee on Wednesday subpoenaed Mike Flynn, Trump’s former national security adviser. The subpoena seeks documents from Flynn related to the panel’s investigation into Russia’s meddling in the U.S. election. Flynn’s attorney, Robert Kelner, declined to comment late Wednesday. Former FBI head Comey sent a letter, which was obtained by CNN, to friends and agents.